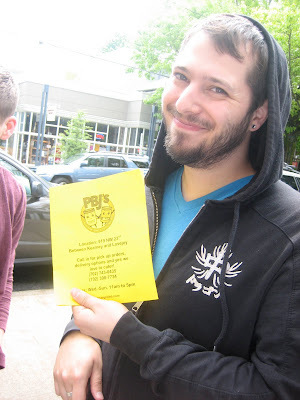 Adam has been dying to go to PBJ's for months now and we finally made it Saturday morning. We saw "the boys" (our neighbors that I refer to as "the boys") as we walked out the door and they made the excellent decision to accompany us, because these sandwiches were AWESOME. 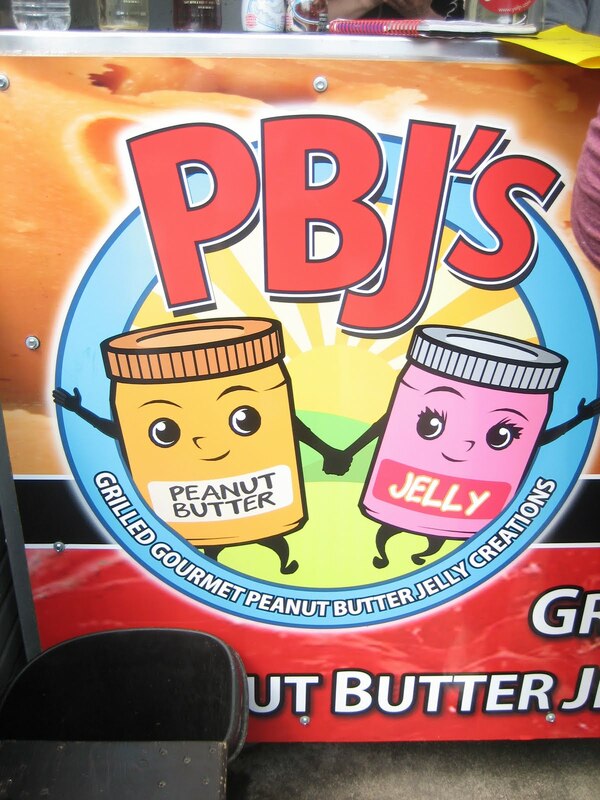 PBJ's offers "grilled gourmet peanut butter and jelly creations"on NW 23rd (closest cross street is Lovejoy). 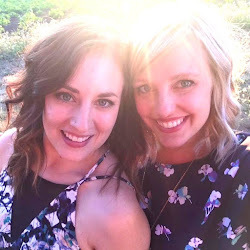 Created by Shane and Keena after moving to Portland a year and a half ago, it is their mission to serve natural and organic ingredients in tasty and creative ways, with a positive attitude! This two man - well to be more exact, 1 man, 1 woman - operation is fine tuned. One person is loading on the ingredients and the other is grilling and wrapping up the final product. Yep, that's homemade peanut butter! Their ingredients are sourced, whenever possible, in Oregon including jam from Oregon Growers in Hood River, hazelnut butter from the Willamette Valley, Dagoba organic chocolate from Ashland, Gabriel's Bakery in Portland, and the peanut butter and almond butter, well, that's made with organic nuts by PBJ themselves! After much contemplation we decided to get three sandwiches, one each and one to share. The sandwiches ended up being pretty big and we totally didn't need three, but we were so excited that it was too hard to choose only two! The sandwiches are designed to be sweet, savory, spicy, or tarte. I went for the Cream of the Crop ($5.50) with challah bread, strawberry jan, bananas, Gina Maria cream cheese, and PBJ's peanut butter. This was sweet, but not too sweet, and basically had an entire banana on it! The cream cheese warmed and softened with the jam and peanut butter was super tasty. Being a sucker for bacon, and spicy foods, Adam opted for the Hot Hood ($5.50) with challah bread, black cherry jam, jalapeno, apple wood smoked bacon and PBJ's peanut butter. When he ordered, he timidly began to ask if he could maybe swap the jalapeno for sriracha, but Keena told him to get it with jalapenos or don't get it at all. They know what they're doing! 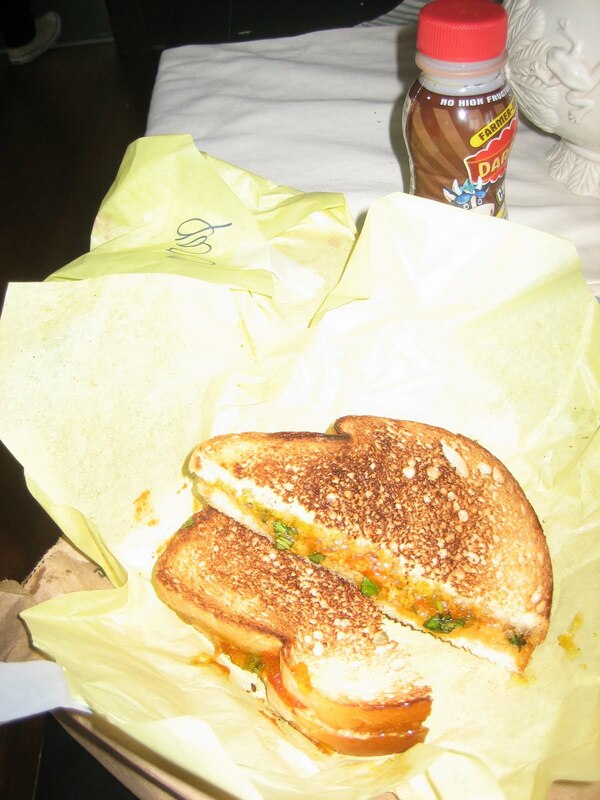 We shared the Spicy Thai ($5.50), challah bread, orange marmalade, sriracha, fresh basil, curry and PBJ's peanut butter based on a recommendation that it was a "favorite." It was also one of the most unique sounding sandwiches on the menu. Keena loaded on the sriracha and for a second I was nervous it would be too spicy for me, but it was absolutely perfect! Some milk definitely helped with the heat. 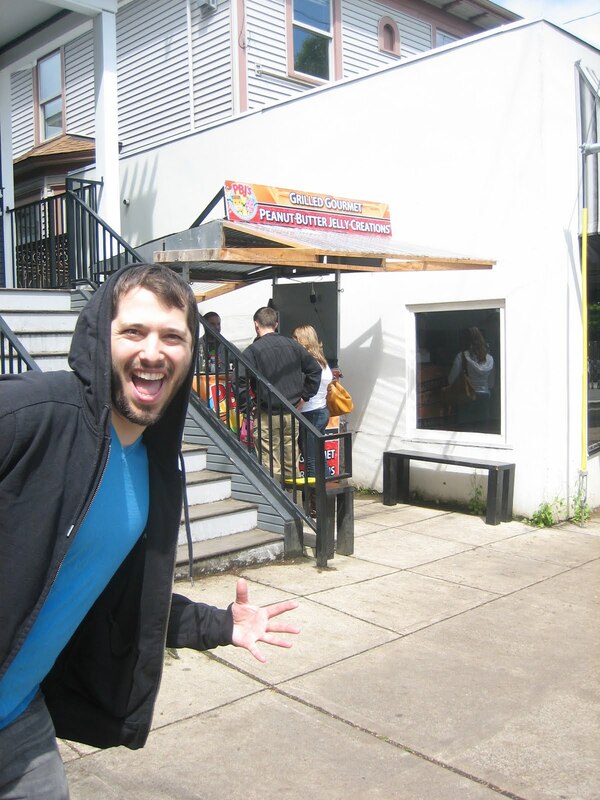 Rick, a fan of bacon like Adam, got the other bacon sandwich, the Good Morning ($6) with challah bread french toast (yum! ), blueberry jam, apple wood smoked bacon, 100% maple syrup, and PBJ's peanut butter. He claims it was better than the Hot Hood so it's on our list for next time! Only a couple of their grilled creations have cheese on them, one was the Oregonian ($5.50) which Charles ordered. With challah bread, marion berry jam, Rogue Creamery blue cheese and Oregon hazelnut butter this sandwich was both savory and sweet. Of course we decided it would be awesome with a little apple wood smoked bacon added! With 12 sandwiches on the menu we still have a lot to try, I'll be back for the Betty ($5.50) with challah bread, Gruyere cheese, bread and butter pickles, white pepper, sea salt, and PBJ's peanut butter. Perhaps a slightly more interesting take on what my dad claims is a delicious sandwich - peanut butter and pickles. We grabbed a to go menu so we'll be back! 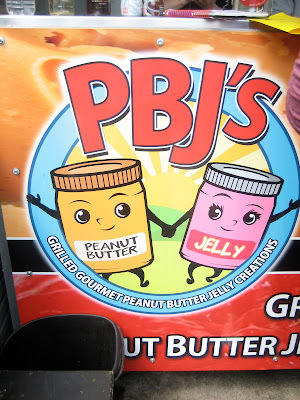 Like many restaurants and food carts these days, PBJ's will also cater! If you have an event coming up, or want to celebrate an accomplishment like Wieden+Kennedy being named agency of the year at The Webby Award, give them a call. Learn more about their catering here.